I recently checked out specialty hot dog joint, Underdog, located at the six corners in Wicker Park. This place is downstairs from legendary taco joint Flash Taco and is serving up Mexi-dogs, a version of Mexican-influenced American hot dogs. 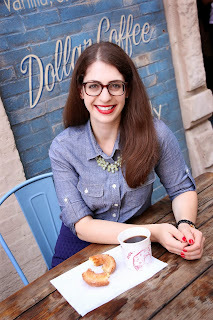 Because of my love for food, especially gourmet food, I've had several people ask me if I ever go out for fast food. The answer is YES and this post proves it! What can I say? I have a soft spot in my heart for cheap and greasy eats. Just not everyday. The space at Underdog is quite small, with just three tables for dining in. It seems most patrons take their dogs to go, especially after a late night bar crawl across Wicker Park. 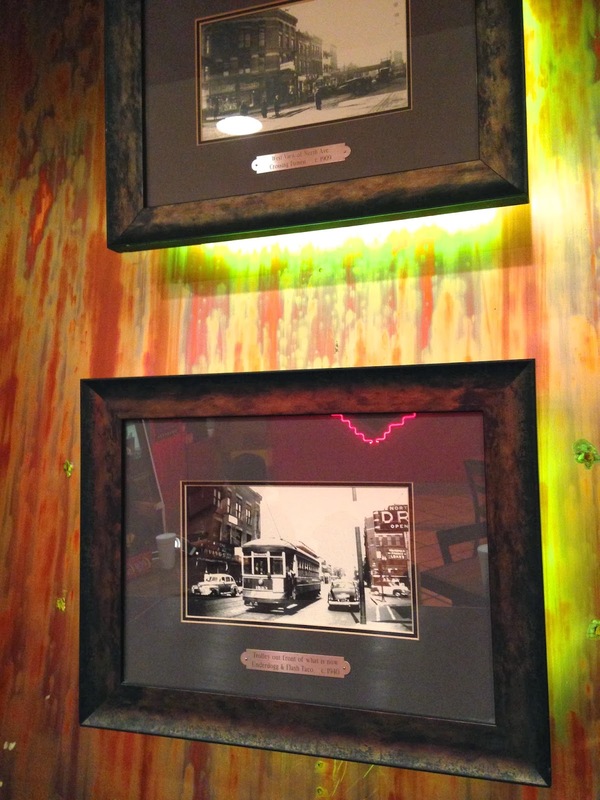 Upon entering, I took note of the framed historic photos of Chicago's six corners. My fellow burger-and-hot-dog-loving-friend, aka the BF, joined me in chowing down on some Mexi-dogs and burgers. Owner Ulysses Salamanca offered up several suggestions, including the Panchito, a hot dog topped with grilled onions, carne asada, queso fresco, and cilantro. The BF and I appreciated the generous amount of toppings, especially the carne asada. All dogs and burgers are served with fries, though the fries we had were pretty stale. No bueno. I also wanted to try the veggie dog on the menu for comparison. El Veggie is a tofu-based veggie dog which was topped with pico de gallo, avocado slices, and corn. I loved the freshness of the toppings, but the acutal hot dog was pretty unappetizing. I kinda new that going in, especially once I got a glimpse of its unnatural orange hue. Oh well, it was worth a shot. Ulysses also recommended one of their burgers, the Chilanga, which was topped with jalapenos, grilled onions, chipotle mayo, bacon, and ketchup. All of their burgers are hand-formed and made from black angus beef. The beef did taste pretty good and the burger was super juicy. Not bad for $6. 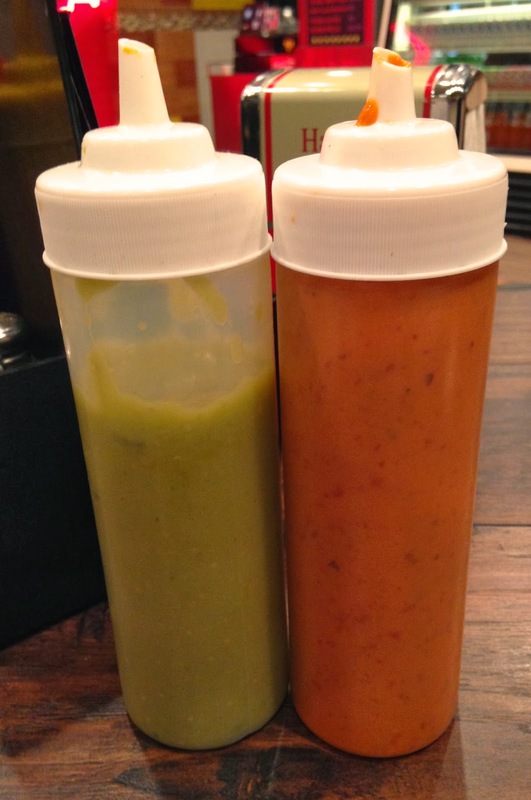 We also tried two of Underdog's homemade sauces. They both were very good and I loved the amount of heat in each. We drizzled both generously on our dogs and burgers. Is Underdog going to replace my favorite hot dog joint, Superdawg? No. But do they have a unique concept? Yes. If you find yourself near the six corners and you've had a few too many fireball shots, you may want to check out Underdog and at least give your body a new late night food option that doesn't involve gorditas or chalupas. Note: My meal at Underdog was complimentary, however, opinions expressed here are my own. I don't see any ratings? What is your rating for Underdog? Or is it because you inly tried three things?? Hi there! If a meal is complimentary and/or the restaurant is aware that I will be dining, I will not give an overall rating. Rather, I will report solely on my experience without a rating, which would be biased.